Badminton Girl isn't much of a manga. In the end, I couldn't help but think that this series had so much potential to make a decent series. Instead, Badminton Girl, while light and charming falls too short to accomplish a great story. I do hope that they make a long series out of it, as it does have some potential. The problem with the story is that it resolved too much on the actual sports, than relation. I do know that the sport in question is on the title name, so I do know how important it is to the manga. However, it seemed that EVERYTHING flowed around it. Call it friendship, a question of choice in life and what so, was all done with badminton. For this fact, the story was very limited. The story could have gone deeper in building new relationships(Which it started to did, but got nothing in the end) and view itself from a wider space (the whole school, instead of only badminton).Another problem is of course the length of the manga. Not only, there are some chapters that could have been developed more, but it also didn't end in a conclusive way, opening itself to new possibilities. In the end, the story is in fact enjoyable, but too quick and too limited to the actual sport. The art is no doubt a great aspect of the manga. Call it a typical shoujo art, it doesn't matter. While there were some minor boringness in the characters design, the whole worked very well for the style of the manga. A very light style for a very light story. The characters in this manga aren't good. Not because they are terrible, or they constantly have contradiction in their personality, but because they aren't developed enough. The main character, Asahi, is a typical innocent and clumsy girl who will always be there to help her friends. and that's about it. She does become somewhat of a prodigy in badminton, which is totally unexpected for a 1 week training, but in term of social and psychological development it doesn't go far. Which is acceptable in a sense, because the story is in fact very short.Not only the main character has this problem, in fact all of them feels incomplete. I'll say it, Badminton Girl has a lovable cast and it's quite hard to hate the characters since they're the image of perfect friends, but this same image is the fact that the cast is not that great. I really enjoyed this manga, despite the length of it. Although I would have preferred if it had been longer with more romance in it, the 6 chapter length was sufficient to solve the main conflicts. 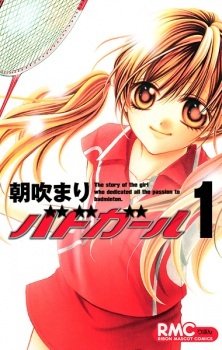 This is the only badminton manga out there that I"m aware of and it was quite an interesting read for me. Again, I wished everything hadn't ended so quickly but I nevertheless liked it a lot.